SpecSeal® Ready® Sleeve pathway kits are complete UL Classified solutions for new and existing cable penetrations through walls and floors. Each sleeve kit contains a Precut Metallic Sleeve, Mounting Escutcheons Plates, Intumescent Escutcheon Gaskets, Wall Warning Labels and Putty Required to Seal Both Ends. 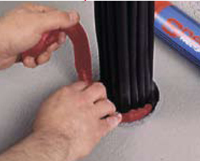 SpecSeal® Ready® Sleeve pathway kits are simple in design and installation. The original Ready® Sleeve (Cat Nos. FS) are engineered for new cabling installations. The 2 and 4 in. (51 and 102 mm) trade sizes incorporate a unique rolled lip design to eliminate potential sharp edges and the need for conduit bushings. The 1 in. (25 mm) trade size requires and includes a bushing. The Ready® Split Sleeve kits (Cat Nos. FSR) are designed for existing cable installations. 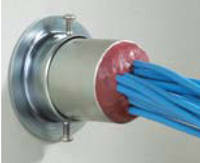 The split sleeves are easily installed around an existing cable bundle. Twopiece split plates and gaskets capture the sleeve and lock it tightly to the barrier. All three sizes include a rolled lip for optimum cable protection.